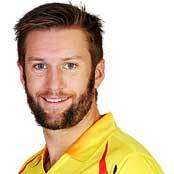 Explore information on profile and biography of Australia cricket player Andrew Tye. Andrew James Tye (born 12-Dec-1986; Perth) is a right-arm medium-fast and right-handed batsman, who plays international cricket for Australia. He made his International debut in T20I against India on Jan. 29, 2016 at MCG and ODI debut against England at same venue on January 14, 2018.